You don't just want to grow thicker, fuller eyebrows. No, you want to know how to get thicker eyebrows naturally, preferably in the comfort of your very own home and without spending much money. If you have thin, sparse eyebrows that you'd like to thicken a bit, there are a lot of methods that you can try at home without investing much money. Some of these home remedies are surprisingly effective at nourishing and thickening your brows back to health. The drawback, of course, is that home remedies to grow thicker brows takes time. And unlike the most effective eyebrow growth serums - all of which also take at least a couple weeks to produce results, even the best home remedies aren't going to produce drastic results. So if you're looking to transform balding eyebrows into Cara Delevingne's - you'll want to skip the home remedies and choose an eyebrow grower that's proven effective. But if a little thickening and darkening is what you're looking for, these home remedies for thicker brows will do the trick. Follow along for a full roundup of what works! See, the nasty thing about plucking that they don't tell you is that it can scar the follicle. That means, if the hair grows back, it might grow back thinner and paler, and if you keep plucking from the same follicle, it can kill it entirely and prevent any hairs from ever coming from that pore again. In short, plucking is bad news for anyone with thin brows. Instead, very carefully shave where you think you need a bit of refinement. Weirdly enough, if used sparingly, this can actually help your eyebrows look thicker, because shaving off the fine tips of the hairs leaves a blunt edge, making the hair look a thicker and darker. Avoid the brows when applying skincare and makeup products, that is. This one's a pretty simple tip, and the bottom line is that getting thing on your brows like sunscreen, moisturizer, foundation, or pretty much anything else not intended for the eyebrows, can clog up hair follicles and discourage growth. So go right up to the brow line when doing your skincare and makeup, but try to avoid getting anything on your brows. Natural oils are full of nourishing nutrients like omega-6 fatty acids, vitamin E and proteins that help moisturize and restore weak eyebrow hairs back to health. This includes oils like castor oil, coconut oil, olive oil, almond oil, emu oil, sesame oil and whole lot of others. But if you really want to take it up a notch, you can combine hair growth promoting essential oils with any one of these carrier oils. You don't want to put essential oils directly onto your skin as this can be irritating, which is why they're commonly mixed with and diluted by carrier oils like castor, coconut and olive oil. Which essential oils are best for getting thicker brows? Rosemary oil, an essential oil derived from the common garden herb rosemary, is one of the best essential oils to help stimulate hair growth, which is why you'll find it prominently featured in pretty much every hair growth shampoo. But rosemary isn't the only essential oil which can help you get thicker eyebrows. Where rosemary invigorates and stimulates the follicles, chamomile oil soothes and conditions, peppermint oil disinfects and may increase blood circulation with its tingling sensation, and lavender oil soothes, moisturizes, and relaxes. Each of these essential oils can have a particular benefit to your eyebrow growth efforts, so use any of them alone or any combination of them, mixed with a carrier oil of your choice! Not actually from horses' tails, the horsetail plant contains silica, which helps to promote stronger hair and nails. You can use it both internally and externally to grow thicker, stronger brows but we recommend doing both - after all, why settle for one when you can do both? You'll find horsetail in a lot of hair growth supplements or in pure extract form. Liquid extracts are particularly convenient to use, since you can just drop some in your tea, juice or coffee or mix it with a natural oil to make your own eyebrow growth serum! You already know that exfoliation is great for your skin. It helps dislodge dead skin cells that can clog your pores, clearing the way for fresh new skin cell underneath. But did you know that exfoliation is also helpful for your brows? One easy thing you can do regularly to help the oils or other home remedies that you're using better penetrate into your hair follicles is to gently exfoliate your brow areas. The gentle massage that's provided as you exfoliate also helps stimulate blood flow to your brow line to further encourage growth. No need for rough, abrasive exfoliants - read: skip the St. Ives. Instead, go for gentle exfoliators like a konjac sponge, a Clarisonic or a gentle exfoliating facial cleanser. Biotin, also known as vitamin B7, one of the myriad B vitamins that make up the B-complex (there are 8, to be precise), might be particularly helpful at helping you grow strong, robust hair, including (though definitely not limited to) eyebrows. Biotin helps the body metabolize fats, amino acids, and glucose sugar (aka carbs) to help us be energetic and active. It also plays a huge part in making sure our hair, nails, and skin stay robust and youthful. Plus, it's easy to incorporate into your diet - simply stock up on more eggs, avocado, berries, cauliflower, organ meats, fish, legumes, and mushrooms to increase your natural absorption of biotin. Or simply opt for the convenience of a daily biotin supplement! The gel-like insides of the Aloe Vera plant's leaves aren't just good for treating burns and sunburn. This amino-acid rich goopy gel is actually amazing for promoting strong and healthy hair, mostly due to the fact that it's chock full of nutrients and minerals. Precisely, this over wonder gel is carrying 75 nutrients, 20 minerals, 12 vitamins, 18 amino acids, and 200 active enzymes. Whoa. That's serious replenishment to be providing your brows. If it's too much of a bother to make your own aloe vera gel, opt for a pre-made one and simply massage onto your brow every night before bed. Onions have a high amount of sulfur in them. This might not sound like a good thing at first, but consider that hair is made up of proteins, primarily keratin. Keratin, it turns out, is made up in part by a goodly amount of sulfur atoms, which it uses to form bonds to create strands of hair. The type of bonds made determine the texture of your hair to a degree, and hair loss has been linked to the absence of sulfur proteins. Thus, onion juice, with its high sulfur content, can actually do a great deal to help prevent or reverse fallout. Just take a large onion, peel, chop, and throw it in a blender or juicer (you can hand-grate it instead with a cheese grater, but using a blender or juicer is faster, easier, and more effective). Pour the blended mixture into a strainer over a bowl to remove the pulp, and press to remove all the juice you can before tossing the pulp. Massage it into your eyebrows (you can also apply it to your scalp if you're worried about hair loss there), leave it on for a half hour to 45 minutes, then rinse and wash with shampoo. Do note, though, that you should probably only use this eyebrow grower at night...when you're not expecting company. Eggs are one of the most commonly used foods found in most peoples' kitchens, but did you know they can actually help with hair growth too? Egg yolks can condition your hair and may help promote robust growth. It is particularly useful if your eyebrows seem dry or damaged (though again, this is one you can use on your scalp hair too). The yolk is the best part for this, which works out great if you like to cook with egg whites! Just separate out the yolk for hair, and the whites for eating. Try thoroughly beating one yolk with a tablespoon or two of olive oil. Massage it into your eyebrows, leave it in for an hour to an hour and a half, then rinse thoroughly with cool water. Henna provides an all-natural hair tint that strengthens and thickens your hair. Plus, the tint that henna gives hair also has a darkening effect so you may be able to skip eyebrow markers and shadows altogether. Just make sure you apply plenty of Vaseline around your skin before you henna tint your eyebrows since the stuff stains! Henna comes in a variety of colors so you'll be able to find one that comes in a shade to match your natural coloring. 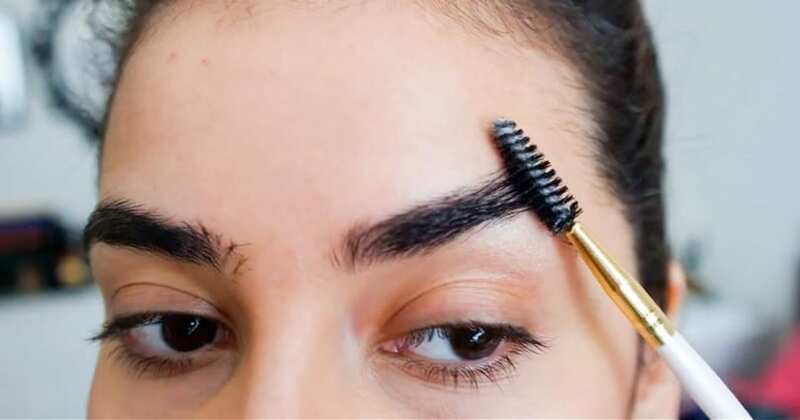 Brushing your eyebrows won't directly stimulate growth, but it helps encourage blood flow to the region and distribute your skin's natural oils to the lengths of your brow hairs - both of which can aid with with eyebrow growth. Even better, brushing your brows can make your eyebrows look fuller when done right. We could write an entire guide on eyebrow brushing techniques alone, but the bottom line is that you want to use an eyebrow brush made specifically for use on eyebrows, and you want to brush in upwards, in the direction of your brows' natural arches. This helps cover up thin spots and creates the illusion of fuller eyebrows. As you can see, there are a ton of options when it comes to helping your brows get thicker and whole lot fuller. Experiment, and find what works for you! When you've got a routine down that seems to help you personally, stick to it. Results can take awhile, at least a few weeks, to see. Best of luck in your eyebrow-filling efforts! Thanks for the information. I did have a question though that I am hoping you can answer. Is it possible to get addicted to essential oils? I mom was asking me and I’m trying to find out for her. I appreciate any answers you can give me.